The lifespan of White LEDs is often claimed by Manufacturers at 100,000 hours. From my tests, it appears the lifespan is somewhat shorter than claimed, or at least, the factor of derating light output is not given proper consideration. I used two white LEDs from 24th November 2005 to 6 September 2007. These were used to light my sink and toilet, saving turning the main lights on, and preventing dazzle when getting up at night. I calculated this would have a very small environmental impact, with the annual power consumption being just 1Kwh. The original LEDs used were claimed by the manufacturer as 10,000mcd with a 15 degree beam. Life expectancy claimed as 100,000 hours. Given I have just purchased 55,000 mcd LEDs with an equal beam width and estimated life span, I thought it worthwhile exchanging the lower efficiency LEDs with the newer higher efficiency types. Some people had noticed a reduction in light output of the original LEDs. I decided to test the comparative light output of the de-commissioned LEDs compared to unused LEDs from the same original batch. 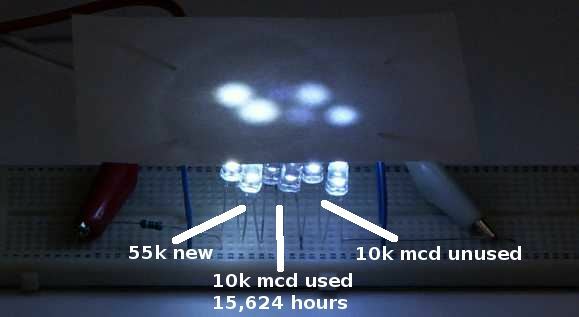 I connected the new 55,000mcd LEDs in series with the de-commissioned LEDs, and unused LEDs from the same batch. The 55,000mcd LEDs are clearly much brighter than he 10,000mcd unused LEDs, which in turn were substantially brighter than the used 10,000mcd LEDs. The used leds have a darkening of the phosphor near the chip. This led me to double-check the current supplied to the LEDs. This was measured at 14ma, which was sustained over the 15,624 operational hours. The LEDs were rated at 20ma operating, 30ma max. Given the LEDs have been operated well within their power envelope, i didn&apos;t expect to see a marked difference in light output over a small proportion of the claimed life expectancy. Given the substantial difference in brightness, and given I don't have equipment to determine absolute brightness, I determined the relative supply current required to light the used and the unused LEDs from the same batch to equal brightness. The used LEDs were supplied with 15ma. The current to the unused LEDs was adjusted to make the apparent brightness equal. We can therefore conclude that after 15,624 hours, with these white LEDs powered at just under 75% of rated current, conversion efficiency drops to just 13% of original efficiency. The claim that these white LEDs have a life expectancy of 100,000 hours is misleading. The colour of the used LEDs is very different from the unused LEDs. The colour changes from a daylight colour to a blue/purple colour. 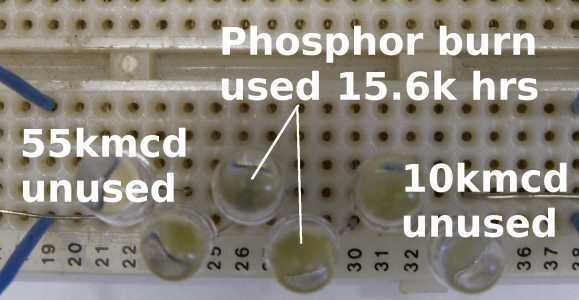 It appears the phosphor used in the LEDs has degraded. The semiconductor chip in the LED may well sustain efficiency for 100,000 hours, however, the phosphor has a much shorter life expectancy. Consequently, the visible light output drops dramatically. I assume the brightness of the new 55,000 MCD LEDs is substantially as a result of improvements to the level of blue/UV emitted by the chip, through improvements in chip manufacturing technology. Possibly less as a result of improvements to phosphors. Given the phosphor in the new 55,000 MCD LED is exposed to perhaps 4 or 5 times the incident radiation of the older 10,000 MCD types, I expect the efficiency of the 55,000 MCD LED will degrade much faster than the 10,000 MCD LED, unless there have been substantial advances in extending the useful life of phosphors. I understand the page has ignited some debate around the application of phosphor based LEDs for long-term lighting applications. One well known LED manufacturer has claimed that the brightness degredation is a function of older LEDs, not newer LEDs. The LEDs I used for what was retrospectively shown to be an experiment were made in early 2005, so are not exactly old LEDs. I have long been an advocate of LED lighting. I feel LED lighting is the future, but only if users know the truth about the longevity of the components they are using. Manufacturers must stop quoting life expectancy based on how long the semiconductor junction may act as a diode, or how long the junction will emit UV light, and start publishing accurate graphs showing visible light output over time. 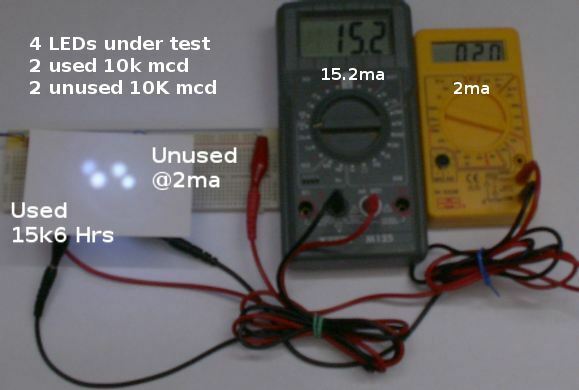 I comissioned two new 55K mcd LEDs at the same time as these test samples were de-comissioned on 6th september 2007. The apparent brighness of the 55K MCD LEDs appears to have already dropped to a small fraction of the original brightness. I will publish the results sometime soon. I call upon any manufacturer who believes their LEDs are not prone to the dramatic light degredation shown in this article, to provide me with standard production samples along with associated part numbers. I will then immediately publish the fact that I have received samples. I will obtain additional samples through component distribution, put them under a long term test at manufacturer's typical ratings, then publish the results here. Manufacturers may email nick [at] nickhill [dot] co [dot] uk.